We like to mix things up on The Pipe Line every once and a while. 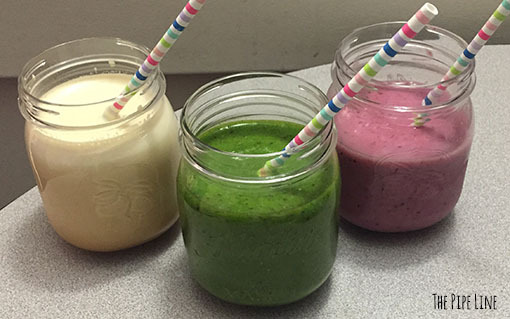 In fact, one of our favorite things to mix up is a good smoothie or protein shake! Today we’re focusing on three of our favorite smoothie and shake recipes, sure to tantalize your taste buds no matter what you’re looking for. We bought our fruit for these smoothies fresh and froze them ourselves, but you can buy frozen fruit at your local grocery store if that’s what you prefer. The Joltin’ Java Protein Shake uses cold brew coffee. If you missed our blog yesterday, here are our instructions for preparing your own cold brew at home! Smoothies and shakes are versatile because you can modify every recipe to your taste and dietary restrictions, with the entire produce section at your disposal, the possibilities are endless. If you thought a green smoothie meant sacrificing taste, let this tasty blend blow your mind. It’s packed with spinach, chia seeds, and coconut water for an added healthy boost to start your day. 1. In a blender, add spinach and coconut water together and blend. Starting with just these two ingredients and blending in layers will help you avoid leafy pieces. 2. Add mango, kiwi, matcha powder, and chia seeds. Blend on high until smooth. If your smoothie is too thick, add some more coconut water. If you need a bit more sweetness, use agave nectar or stevia to sweeten. This refreshing blend of fruit, Greek yogurt, and juice packs an added boost with ground flax seeds and protein powder to refresh you and your taste buds after a good workout! 1. In a blender, combine berries, banana, yogurt, protein powder, juice and ground flax seeds. 2. Blend on high until smooth. If your smoothie is too thick, add some more juice to thin it out. If your smoothie needs some added sweetness, use some agave nectar to taste. Love the idea of a blended frozen coffee drink, but hate the idea of the calories? Use some homemade cold brew, protein powder, and coconut oil to create a great pick-me-up. 1. In a blender, combine coffee, protein powder, MCT Coconut Oil, and ice. 3. If preferred, add some almond milk or sweetener to taste. 4. Garnish with cinnamon or cocoa powder if desired. Serve chilled and enjoy! Tip: if you find that your protein shake is separating, try adding a pinch of Piping Rock Xantham Gum to blender. What’s your favorite smoothie or protein shake recipe? Share it with us here in the comments!